The history of Lahore is not stoppable. With each day we discover new things about Lahore. Things forgotten with time. Upraised CHOONA work seems to have been a speciality of Lahore. The Choona Naqashi upraised work in the Mausoleum of Nawab Asif Khan tells us a lot about this tradition. Friezes in Mandirs were there, but friezes in havellis even rarer. I remember a KUTOAN KEE HAVELLI in Rang Mahal Lahore which used to have such friezes in wood placed at regular intervals in walls. The subject varied but included Prophet Yunus (Jonah) and the miraculous survival in the mouth of the fish whale. We have some in our museum. Upturned choona naqashis are there in the Golden Temple and there are miniatures of Mian Raheem Baksh Mimar who made them there. Other mosques both in Lahore as well as in Bhawalpur show the tendency. Ziauddin Chughtai Drawing Master Aitchison College Lahore as well a Mian Kareem Baksh Mimar specialized in such Choona work. But figures are comparative rarer. 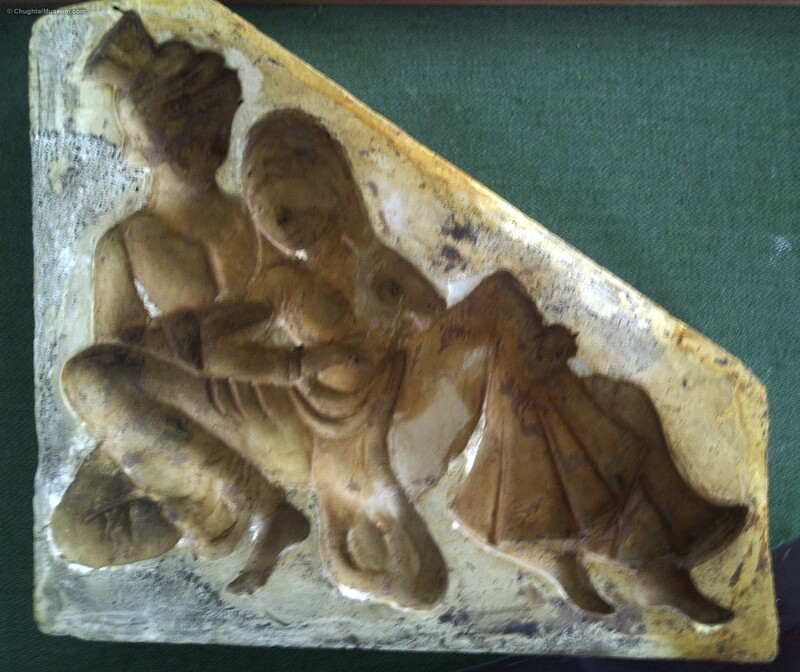 So when we came across a trove of moulds depicting soft animals, ladies in Ghararas, shalwars and dhotis, we knew we had touched upon a Punjab tradition, unrecorded in Lahore so far. But the figurative drawing is very very modern. It had echoes of Chughtai Art in it. We do not know how old they are, hanging in a wall on a room , 10 feet across, small bricked house outside Delhi Darwaza, that is Bazaar Naulakha, near the Mosque of Mian Sultan Takhaydar, but we would place them from about 80 to 150 years, if we can. No religious subjects here, just aesthetics at stake. There are beautiful moulds of small children in them too. Deers and horses are there. Romantic couples Punjab type. Men support PHAGS on their heads. Peeris (seats) in many of them. Amazing all of them! Worth seeing, worth publishing in book form. But who cares for culture? Our so called cultural freaks spend most of their time in demolishing our own culture. Their interest related to royal commands from foreign lobbies. Soul-less people, indeed!